The Arm (R) Cortex(R)-M0 processor is the smallest Arm processor available. The exceptionally small silicon area, low power and minimal code footprint of the processor enables developers to achieve 32-bit performance at an 8-bit price point, bypassing the step to 16-bit devices. The ultra-low gate count of the Cortex-M0 processor also enables its deployment in analog and mixed signal devices. Through the Arm DesignStart online access portal, users have free-of-charge access to Arm IP for system design and simulation as well as a low-cost prototyping package on FPGA to quickly develop proof of concept systems. The code density and energy efficiency benefits of Cortex-M0 mean that it is a natural and cost effective successor to 8/16-bit devices in a wide variety of applications, while retaining tool and binary upwards compatibility with the feature-rich Cortex-M3 and Cortex-M4 processors. 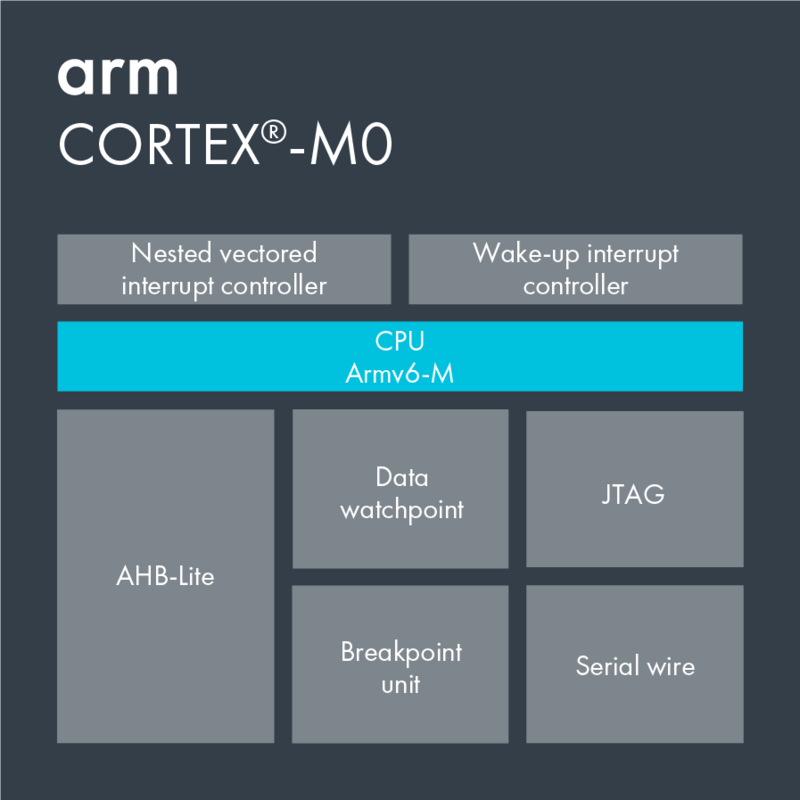 For applications requiring even lower consumption or a wider choice of design options, the fully compatible Cortex-M0+ processor is an ideal alternative. The Cortex-M0 processor, which consumes as little as 16uW/MHz (90LP process, minimal configuration) in an area of under 12 K gates, builds on the unrivalled expertise of Arm as a leader in low-power technology and a key enabler for the creation of ultra low-power devices. With just 56 instructions, it is possible to master quickly the entire Cortex-M0 instruction and its C friendly architecture, making development simple and fast. The option for fully deterministic instruction and interrupt timing makes it easy to calculate response times. Designed to support low power connectivity such as Bluetooth Low Energy (BLE), IEEE 802.15 and Z-wave, particularly in analog devices that are increasing their digital functionality to pre-process and communicate data efficiently.